BELGRADE, March 19. /TASS/. President of Republika Srpska (part of Bosnia and Herzegovina) Milorad Dodik has congratulated Vladimir Putin on his convincing victory at Sunday’s presidential polls in Russia and said he had no doubts of that. "I am confident of his victory. Putin is an incontestable political leader of the Russian people and, I would say, an incontestable political leader of the entire free world, of all those who want to respect others, who loath to impose anything on others. I think he has managed to make Russia strong again and has won a great victory," his said in a video address. Commenting of the recent opinion poll in Serbia, which demonstrated 58% support to the Russian leader, Dodik noted, "I am sure that if such a poll were conducted in Republika Srpska, the results would be the same." Russia held its presidential election on Sunday, March 18. 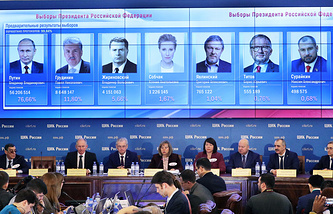 Eight candidates were running for the highest office in the Russian Federation. Among them were: incumbent President Vladimir Putin; Pavel Grudinin, director of the Lenin State Farm (nominated by the Communist Party of Russia); TV personality and socialite Ksenia Sobchak (nominated by Civil Initiative); Sergey Baburin, head of the Russian People’s Union party; Maxim Suraikin, chairman of the Central Committee of the Communists of Russia party; Boris Titov, chairman of the Party of Growth and Russian Presidential Envoy for Entrepreneurs’ Rights; Grigory Yavlinsky, head of the Yabloko Party’s federal political committee; Vladimir Zhirinovsky, leader of the Liberal-Democratic Party of Russia (LDPR). According to the latest update from Russia’s Central Election Commission, Putin is heading for a landslide victory, with 75.91% of the vote.